The beautiful thing about mixed media is there are so many techniques for getting a wide variety of styles and effects, especially when using the DecoArt Media line of products. 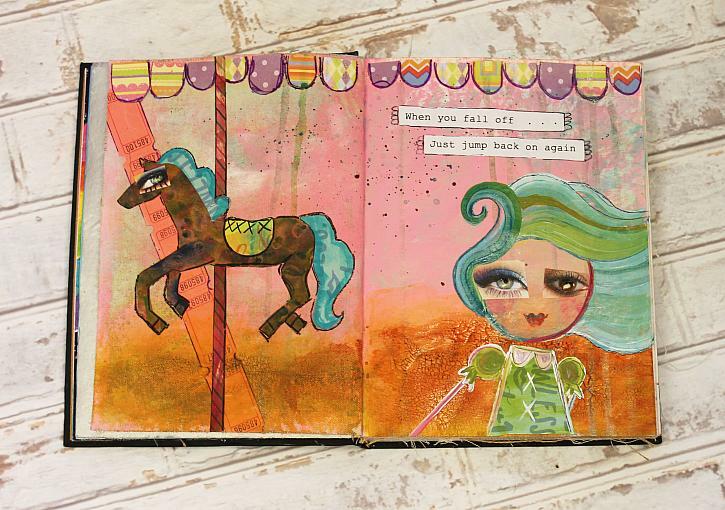 This mixed media journal spread has a whimsical style with its fun, bright elements and use of magazine cut-outs. See how to create this effect below! Make pink by mixing 4 parts DecoArt Media Fluid Acrylics in Titanium White and 1 part Primary Magenta. Use a medium brush to loosely paint your pages in pink. Let dry. Place tickets at a diagonal and adhere with a medium brush and DecoArt Media Matte Medium. Let dry. Use a Sharpie to loosely outline. Cut out scrapbook paper in “U” shapes (varying sizes). Use a medium brush and Matte Medium to adhere to the top of both pages. Let dry. Use a Sharpie to loosely outline. Use a medium brush to paint the ground in Quinacridone Gold. Let dry. Use a medium brush to apply DecoArt Media Crackle Glaze over the Quinacridone Gold. Let dry. Use a medium brush to apply Dark Grey Value 3 over the Crackle Glaze and wipe back. Use a small brush to add drips (rain) in Dark Grey Value 3. Let dry. Use scissors to cut out the carousel’s horse pole and adhere with a medium brush and Matte Medium. Find photos and use scissors to cut out carousel horse shapes and use a medium brush to adhere in place with Matte Medium. Cut out eyes from a face found in a magazine; use a medium brush to adhere in place using Matte Medium. Use a Sharpie to loosely outline and add details to the carousel horse. Trace an outline of a girl. Use a medium brush to paint her face in Titan Buff. While still wet paint her cheeks with pink. Use a medium brush to paint her hair in Cobalt Turquoise, Titanium White, and Green Gold. Use a small brush to outline her face in Cobalt Turquoise and pink. Trace a dress onto scrapbook paper and use scissors to cut it out. Adhere in place using a medium brush and Matte Medium. Use a small brush to paint details in Titanium White and pink. Use scissors to cut out eyes from a magazine. Adhere in place with Matte Medium. Use a small brush to paint the lips in Primary Magenta and add accents in Dark Grey Value 3. Print out a quote and adhere in place using a medium brush and Matte Medium. Let dry. Use a Sharpie to outline and add detail. Use DecoArt Media Liquid Glass in both the horse’s and the girl's eyes. Let dry. And that's it! Be sure to check out the DecoArt Mixed Media Blog to see projects from your favorite artists in a variety of styles.